Fundraiser by Aleshia Amadi : Supporting the Vision of WAATK! Supporting the Vision of WAATK! We are Henry and Aleshia Amadi: A dynamic duo husband and wife team who recently established and created: "We Are All Things Kingdom" on January 14, 2018. This was birthed on the birth day of our dear and precious daughter, Charity Grace Amadi, which was also her last day on this earth. Though she was stillborn at 7 months old, she was STILL BORN, which was the promise that the Lord gave to us. Through her passing, we have been able to birth and release so much, which is a blessing. "We Are All Things Kingdom" is a Kingdom business devoted to spreading the Gospel of Jesus Christ in all that we do and promote. Our motto comes from 1 Corinthians 3:11 which states: "For no one can lay a foundation other than the one which is [already] laid, which is Jesus Christ." Currently, we release daily messages (devotionals) that are Spirit-filled to encourage, uplift, minister, inspire and enlighten all hearts that take the time to read. However, there is so much more that our heart desires to do with this Kingdom business. We are very innovative, creative and have so many visions within us that are meant to come forth. With that being said, we need ALL the financial help we can get to allow this business to flourish and take off. Our goal with "We Are All Things Kingdom" is to release merchandise such as: Tote bags, pens, notepads, wristbands, tee shirts, mugs and so much more. We also desire to speak at various events (as the Lord leads and opens up) to share our testimony and to impart into people's lives the true Gospel of Jesus Christ. Connecting, reaching and imparting is our heart's desire! Your support will mean so much to us and we bless the Lord in advance and thank you all in advance who will support this vision. Whatever is on your heart to give, Henry and I thank you greatly! We do not have a set date with our goal, as we are trusting the Lord to have his way with this campaign. 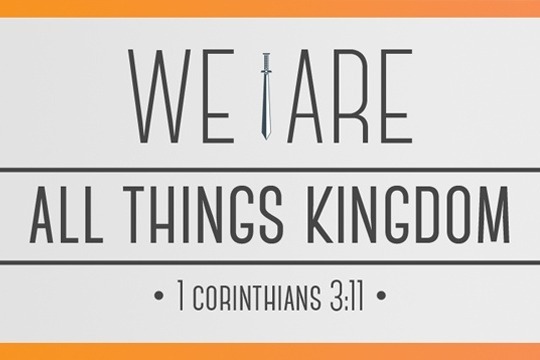 We encourage you to check out our website "We Are All Things Kingdom" for our daily messages and to stay updated on our events, soon to come merchandise and all that God is doing with us! Again, we thank you all in advance for supporting!